Out of Summer Hybernation… and Into Cross Campus! CompanyOut of Summer Hybernation… and Into Cross Campus! Yeah, yeah, you hibernate in the winter, right? Not us. We’ve been hitting it hard all summer in our work cave, but now we’re back! We’d originally thought about a co-working tour last spring, but got busy with clients and just let it go. 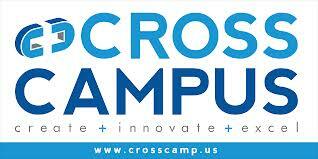 Cut to September when we took one of our clients to meet our old pal, Adam, from Indiegogo at Cross Campus. One look at the velvet couches and it was all over. The space, people, and location have been fantastic. There is literally nothing negative to say about it. The one comment a few of my visitors have made “it’s pretty quiet in here” is yet another thing I love. But it’s not creepy quiet, people speak softly and there’s always some weird, strangely enjoyable apple-commercial-esque music playing.